The United States on Thursday vowed to remain “relentless” in pressuring Iran to deter its missile program after the Islamic Republic unveiled a new ballistic weapon days after testing a cruise missile. 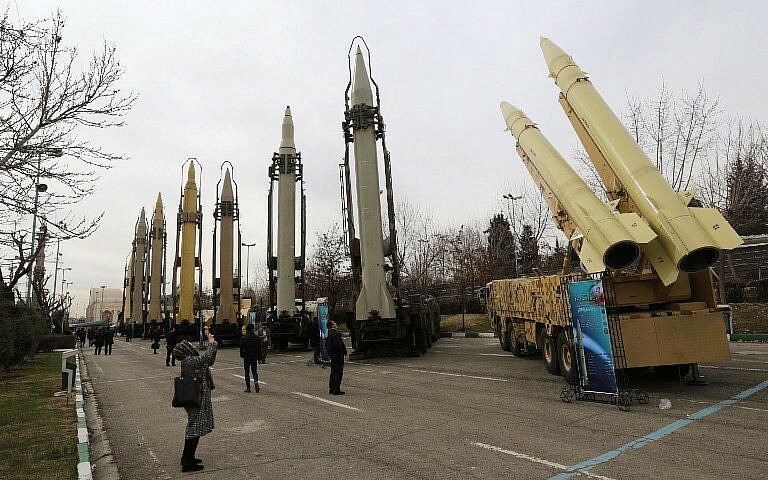 Iran’s Revolutionary Guards last week unveiled a new ballistic missile with a range of 1,000 kilometers (620 miles), their official news agency Sepah News reported. Tehran, which calls for the destruction of Israel, insists that it sees the missile program as crucial to its defensive posture, and says its existence is non-negotiable. It has also maintained that it never intended to develop nuclear weapons and therefore its missile development does not violate the agreement. However, Prime Minister Benjamin Netanyahu has presented evidence which he says details Iranian efforts and research programs specifically aimed at producing atomic weapons. In a Mossad operation, Israel earlier this year spirited out a trove of Iranian documentation from Tehran’s nuclear weapons archive, which Netanyahu said proved conclusively that Iran is lying when it says it has not been working toward a nuclear weapons arsenal. This entry was posted on February 8, 2019 at 8:44 AM and is filed under Uncategorized. You can subscribe via RSS 2.0 feed to this post's comments. You can skip to the end and leave a response. Pinging is currently not allowed. All the talk is useless exept its followed by action..